MP 3..1 How can we idealize fuel addition as heat addition? The validity of an approximation rests on what the answer is going to be used for. We are seeking basically only one item concerning combustor exit conditions, namely the exit temperature or the exit enthalpy. The final state is independent of how we add the heat, and depends only on whether we add the heat. If it is done from an electrical heater or from combustion, and if we neglect the change in the constitution of the gas due to the combustion products (most of the gas is nitrogen) the enthalpy rise is the same no matter how the temperature rise is achieved. MP 3..2 Since , looking at the - graph, does that mean the farther apart the , isotherms are, the greater the efficiency? And that if they were very close, it would be very inefficient? Thus for given values of and , depends only on the temperature of the cold reservoir , which is limited by the temperatures naturally available to us. These temperatures are all well above absolute zero, and there are no means to reduce to negligible values. The consequence of this is that the Carnot cycle efficiency cannot approach one ( only if , which is not possible). MP 3..3 In the Carnot cycle, why are we only dealing with volume changes and not pressure changes on the adiabats and isotherms? For a process we can integrate from 1 to 2 and get , or . This relation shows how pressure and volume changes are related to one another during an adiabatic reversible process. During an isothermal process, the temperature stays constant. Using the equation of state for an ideal gas, , we find that on an isotherm. Again, this relation tells us how pressure changes are related to volume changes during an isothermal process. Note that in the - diagram, adiabats ( ) are steeper curves than isotherms ( ). MP 3..4 Is there a physical application for the Carnot cycle? Can we design a Carnot engine for a propulsion device? We will see that Carnot cycles are the best we can do in terms of efficiency. A constant temperature heat transfer process is, however, difficult to attain in practice for devices in which high rates of power are required. The main role of the Carnot engine is therefore as a standard against which all other cycles are compared and which shows us the direction in which design of efficient cycles should go. MP 3..5 How do we know which cycles to use as models for real processes? We have discussed this briefly for the Brayton cycle, in that we looked at the approximation that was made in saying heat addition occurred at constant pressure. 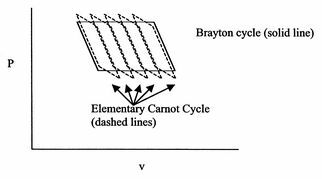 You can also see that the Carnot cycle is not a good descriptor of a gas turbine engine! We will look further at this general point, not only for the Brayton cycle, but also for the Rankine cycle and for some internal combustion engine cycles. I will try to make clear what are the approximations and why the cycle under study is being used as a model. MP 3..6 How is calculated? For now, we rely on tabulated values. In the lectures accompanying Chapter 15 of the notes, we will see how one can calculate the heat, , liberated in a given reaction. Stoichiometric conditions are those in which the proportions of fuel and air are such that there is not an excess of either one in the combustion reaction -- all the fuel is burned, and all the air (oxidizer) is used up in the reaction. See Chapter 15. MP 3..8 When and where do we use and ? Some definitions use . Is it ever ? The answer is no. The definitions of and are derived in the notes in Section 2.4. is the specific heat at constant pressure and for an ideal gas always holds. Similarly is the specific heat at constant volume and for an ideal gas always holds. A discussion of this is also given in the notes in Section 2.4. If you think about how you would measure the specific heat for a certain known change of state you could do the following experiments. where both the heat transferred and the temperature difference can be measured. MP 3..9 Explanation of the above comparison between Diesel and Otto. Basically we can operate the diesel cycle at much higher compression ratio than the Otto cycle because only air is compressed and we don't run into the auto-ignition problem (knocking problem). Because of the higher compression ratios in the diesel engine we get higher efficiencies. MP 3..10 Would it be practical to run a Brayton cycle in reverse and use it as refrigerator? Yes. In fact people in Cryogenics use reversed Brayton cycles to cool down systems where very low temperatures are required (e.g., space applications, liquefaction of propellants). One major difference between a regular Brayton cycle (such as a jet-engine or a gas-turbine) and a reversed Brayton cycle is the working fluid. In order to make a reversed Brayton cycle practical we have to choose a working fluid that is appropriate for the application. Extremely low temperatures can be achieved when using a regenerator -- a heat exchanger that preheats the fluid before it enters the compressor and cools the fluid further down before it enters the turbine. In this configuration the fluid is expanded to much lower temperatures, and more heat can be absorbed from the cooling compartment. MP 3..11 When flow is accelerated in a nozzle, doesn't that reduce the internal energy of the flow and therefore the enthalpy? Indeed both enthalpy and internal energy are reduced. The stagnation enthalpy is the quantity that is constant. MP 3..12 Why do we say that the combustion in a gas turbine engine is at constant pressure? where is the speed of sound and is the Mach number. Velocity changes are therefore related to area changes (geometry) and density changes (basically heat input). For a gas turbine combustion process the change in density is comparable with (a significant fraction of) the initial density and the area change is several times the initial area. This means that the change in velocity divided by the initial velocity is roughly of the order of magnitude of unity. The momentum equation thus tells us that for small Mach number (say 0.1) the ratio will be much less than one, so that the pressure can be approximated as constant. In reality the pressure does drop in the combustor, but the overall drop from inlet to exit is about 3-4%, small compared to the initial level of pressure, so that the approximation of constant pressure is a useful one. The rapidity of the combustion process does not really have anything to do with this approximation. We could have a process, such as a nozzle, in which there was combustion at the same time that the pressure was dropping. As seen from the momentum equation, the heat addition does not ``directly'' affect the pressure -- changes in pressure are associated with changes in velocity. MP 3..13 Why is the Brayton cycle less efficient than the Carnot cycle? Consider the Brayton cycle and the corresponding work done as being approximated by a number of elementary Carnot cycles, as shown by the dashed lines in Figure 3.26. All of these Carnot cycles have the same pressure ratio, thus the same temperature ratio, and thus the same efficiency. The temperature ratio that figures into the efficiency of the elementary Carnot cycles is the inlet temperature divided by the compressor exit temperature, not the maximum cycle temperature, which is at the combustor exit. The basic reason for the lower efficiency is that heat is absorbed at an average temperature that is lower than the maximum temperature and rejected at an average temperature higher than the minimum temperature. We will come back to this important point (which has implications for all cycles), but if you cannot wait, see Chapter 6 of the notes. Figure 3.26: Brayton cycle considered as a number of elementary Carnot cycles, all having the same pressure ratio and therefore the same temperature ratio, which is lower than the overall cycle temperature ratio, . MP 3..14 If the gas undergoes constant pressure cooling in the exhaust outside the engine, is that still within the system boundary? When we analyze the state changes as we trace them around the cycle, we are viewing the changes in a system, a mass of fixed identity. Thus we follow the mass as it moves through the device and the cooling of the gas outside the engine is happening to our system. MP 3..15 Does it matter what labels we put on the corners of the cycle or not? It does not matter what labels we use on the corners of the cycle. A cycle is a series of processes. Independent of where you start in the cycle, it always brings you back to the state where you started. MP 3..16 Is the work done in the compressor always equal to the work done in the turbine plus work out (for a Brayton cyle)? Thus the net work is the difference between the enthalpy drop across the turbine (we get work from the turbine) and the enthalpy rise through the compressor (we have to supply work to the compressor). MP 3..17 What are the units of in ? The units of power are J/s (kJ/s, MJ/s) or Watts (kW, MW). The mass flow is kg/s. The units of , work per unit mass, are thus J/kg. For the aeroengine, we can think of a given diameter (frontal area) as implying a given mass flow (think of a given Mach number and hence a given ratio of flow to choked flow). If so, for a given fan diameter power scales directly as work per unit mass. MP 3..18 Question about the assumptions made in the Brayton cycle for maximum efficiency and maximum work. We have first derived a general expression for the thermal efficiency of an ideal Brayton cycle (see Equation 3.10). The assumptions we made for the cycle were that both the compressor and turbine are ideal, such that they can be modeled adiabatic and reversible. We then looked at possible ideal Brayton cycles that would yield (A) maximum efficiency and (B) maximum work, keeping the assumptions of an ideal cycle (the assumptions of adiabatic and reversible compression and expansion stem from the choice of an ideal cycle). One way to construct an ideal Brayton cycle in the - diagram is to choose the inlet temperature and inlet pressure , the compressor pressure ratio or temperature ratio , and the turbine inlet temperature . Apart from setting the inlet conditions (these mainly depend on the flight altitude and Mach number and the day), we decided to fix the turbine inlet temperature (fixed by material technology or cost). So the only two ``floating'' cycle parameters that remain to be defined are the compressor exit temperature and the turbine exit temperature . Looking at Equation 3.10 we know that the higher the compressor temperature ratio the higher the thermal efficiency. So, for (A) maximum efficiency we would choose the compressor exit temperature as high as possible, that is in the limit . Constructing this cycle in the - diagram and letting approach shows that the area enclosed by the cycle, or in other words the net work, becomes zero. Thus a cycle constructed for maximum efficiency, under the given inlet conditions and constraints on , is not very useful because we don't get any work out of it. For the derivation of for maximum work (keeping fixed as above), see notes for details. MP 3..19 You said that for a gas turbine engine modeled as a Brayton cycle the work done is , where is the heat added and is the heat rejected. Does this suggest that the work that you get out of the engine doesn't depend on how good your compressor and turbine are?...since the compression and expansion were modeled as adiabatic. Thus the net work is the difference between the enthalpy drop across the turbine (we get work from the turbine) and the enthalpy rise through the compressor (we have to supply work to the compressor, this is done through the drive shaft that connects turbine and compressor). In class we analyzed an ideal Brayton cycle with the assumptions of adiabatic reversible compression and expansion processes, meaning that the work done by the turbine is the maximum work we can get from the given turbine (operating between and ), and the work needed to drive the given compressor is the minimum work required. In the assumptions the emphasis is put on reversible rather than adiabatic. For real engines the assumption of adiabatic flow through the compressor and turbine still holds. This is an approximation -- the surface inside the compressor or turbine where heat can be transferred is much smaller than the mass flow of the fluid moving through the machine so that the heat transfer is negligible -- we will discuss the different concepts of heat transfer later in class. However the compression and expansion processes in real engines are irreversible due to non-ideal behavior and loss mechanisms occurring in the turbomachinery flow. Thus the thermal efficiency and work for a real jet engine with losses depend on the component efficiencies of turbine and compressor and are less than for an ideal jet engine. We will discuss these component efficiencies in more detail in class. MP 3..20 Why don't we like the numbers 1 and 2 for the stations? Why do we go 0-3? A common convention in the industry is that station 0 is far upstream, station 1 is after the shock in the inlet (if there is one), station 2 is at inlet to the compressor (after the inlet/diffuser) and station 3 is after the compressor. In class, when we examined the ramjet we considered no changes in stagnation pressure between 0 and 2, so I have used 0 as the initial state for the compression process. It would be more precise to differentiate between stations 0 and 2, and I will do this where appropriate. MP 3..21 For the Brayton cycle efficiency, why does ?